Scattered thunderstorms in the morning becoming more widespread in the afternoon. High 74F. Winds S at 5 to 10 mph. Chance of rain 90%..
Thunderstorms in the evening, overcast overnight with occasional rain. Low 59F. Winds SW at 5 to 10 mph. Chance of rain 80%. ULLIN — Claude Raymond Shupe Jr., 60, formerly of Van Buren, Missouri, died at 3:51 p.m. Monday, Feb. 20, 2017, in Saint Francis Medical Center in Cape Girardeau. Claude was born Jan. 26, 1957, in St. Louis, Missouri, the son of Claude Raymond Shupe Sr. and Mildred (Lamb) Shupe. He married Gloria Maxine Crain on July 2, 1986. Claude served in the U.S. Army from 1975 to 1995 and retired as a Sergeant First Class at Fort Campbell, Kentucky. He served in Somalia during Operation Restore Hope. He was recently a retired grounds and maintenance laborer at District 22 State Police Headquarters in Ullin. 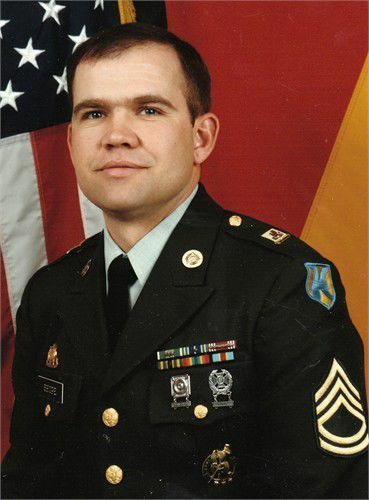 While serving his country he received the Army Achievement Medal (2nd Award), Meritorious Service Medal, Army Commendation Medal (3rd Award), Army Good Conduct Medal (6th Award), National Defense Service Medal, Armed Forces Expeditionary Medal, Noncommissioned Officer’s Professional Development Ribbon with Numeral 3, Army Service Ribbon, Overseas Service Bar (2nd Award), Humanitarian Medal. Claude loved to garden, hunt, fish and had a love for guns. Claude is survived by his wife, Gloria Maxine Shupe of Ullin; son, Shawn (Melanie) Archione of West Frankfort; grandchildren, Anthony and Michael Archione of West Frankfort; sisters, Dianna (Cecil) Price of Van Buren, Missouri, Anita (Keith) Sutherland of Van Buren; nephews, Homer (Koty) Townsley of Van Buren, Missouri, Robert (Kim) Townsley of O’Fallon, Missouri, Shawn (Pam) Price of Jackson, Missouri; niece, Brittney Ellison of Van Buren, Missouri; beloved pets, Bamster the cat and Tom the cat; and several other nieces, nephews and other relatives. Services for Claude Raymond Shupe Jr. will be at 11 a.m. Thursday, Feb. 23, in Crossroad United Methodist Church, with Pastor Cecil Atchison officiating. Interment will follow in Mound City National Cemetery, with full military rites accorded by the American Legion Post 178 and the Illinois Honor Guard. Visitation will be from 9:30 to 11 a.m. Thursday at the church. Memorials may be made to Feed the Children Foundation and will be accepted at the church. Crain Funeral Home in Ullin is in charge of arrangements. To view the full obituary or to leave an online condolence for the family, visit www.crainsonline.com. the life of: Claude Shupe Jr.